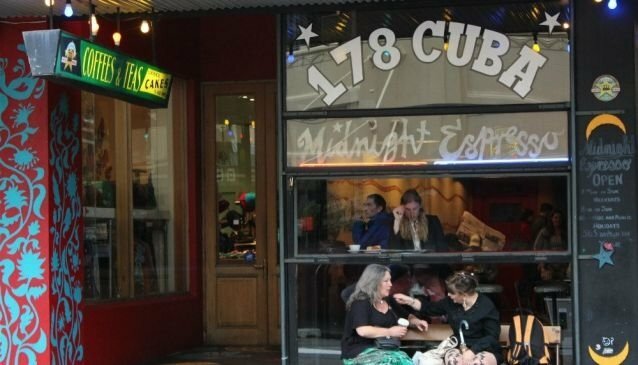 Established in 1988, Midnight Espresso is situated on the popular Cuba Street and is a place to relax, enjoy a cup of coffee and enjoy some good food until late in the night. The cafe is a place to catch up with friends, with a lively atmosphere enhanced by the often loud music. The menu offers wholesome and hearty dishes for breaksfast, lunch and dinner. The menu is ideal for vegans and vegetarians and features such treats as vegan nachos, vegan tofu & scramble and vegetarian lasagne. However, there are plenty of options for all diners including burgers, pancakes, hasbrown steak and more. The food counter includes a range of vegetarian and vegan option along with a wide selection of Havana coffee beans that can be purchased. The dessert counter features caramel slices and chocolate chip cookies and a whole host of other sweet treats.